To embellish the image I used embossing powders in an untraditional way. I have some Lindy Stamp Gang two toned embossing powders one was called Madonna Robe, its a light blue/gold combo and a pearlescent white called Magic Moon Pearls, two-toned. I used an Ranger Perfect Medium brush embossing ink pen and filled the moon in with the ink on the top of the moon. I poured the powder, heat set it and then repeated the process twice more, filling more of the moon and retracing over the already embossed areas making them thicker. The effect is more pronounced in person of coarse! 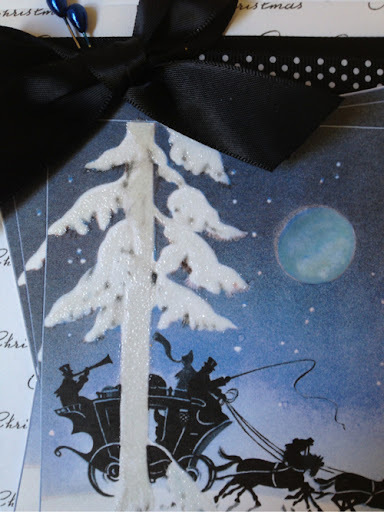 The other LSG was used on the trunk, and on the tree branches I used Stamp N' Bond with a layer of Tim Holtz's Distress dry glitter. Christmas may have already passed but hey now I am one card down for Christmas 2013! 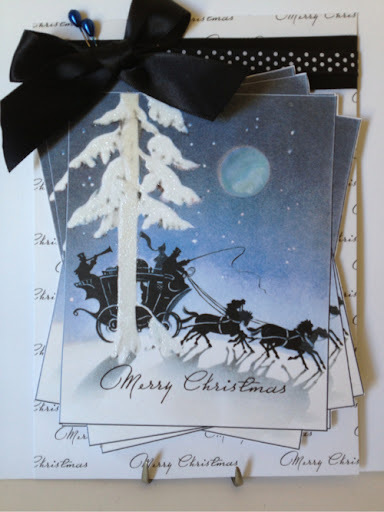 This is such a beautiful winter card, fab design and that image is wonderful! ooh Wow.. great technique! Great card! Loving it! A beautiful winter card! Thanks for joining the Card Caravan!